For the past 40 years, California has consistently ranked near the very bottom for school library funding nationwide. This has resulted in a limited number of books per children in schools, a reduced number of librarians, and, in come cases, no operating school library. ​Currently, there is no designated school library funding provided by the state. Schools may apply for a school and library improvement block grant. This money can be used for school libraries or other school improvement issues - such as carpeting, painting or playground equipment. In most California schools, and across the nation, the quality of the school library is a direct result of parental supported funding. Keep in mind that libraries, especially in poor, urban areas have been long neglected. Some have as little as three books per child and these books are old and outdated. Forty years of neglect cannot be undone with the funds from these bills. Building a library collection requires a steady influx of high quality, high interest books over time. 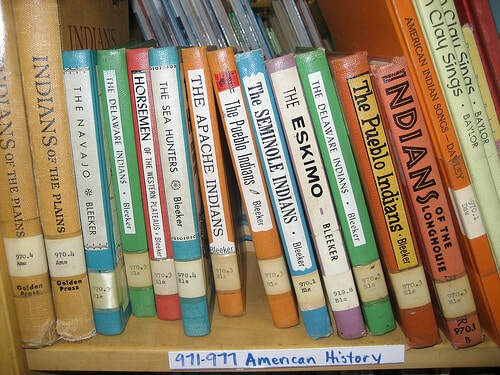 Right: tattered, outdated American History books at Burbank Elementary in Pasadena. Most public schools in California purchase library books through district-approved vendors. These vendors sell "shelf ready" books at a considerable markup (often twice the book's list price). A typical hardcover, shelf-ready library book may cost around $27, which is prohibitive for many under-served schools. Click here to view a document on library book values. When funds are available, most schools opt to purchase reference materials. This means there is limited access to pleasure reading material for children. Studies confirm that children, especially poor children, get a large percentage of books from the school library. Unfortunately, when confronted with a library lacking in pleasure reading material, students are less inclined to pick up a book. ​In the absence of poverty, the quality of the school library is the best predictor of reading scores. There is a huge disparity among children’s access to books. Affluent children have more books at home, better public libraries, and often go to schools with better school and classroom libraries. In some cases, affluent children have access to more books in their home than poor children have in their home, public libraries, school and classroom library combined. Please see: Constantino, R. (2005) “Print environments between high and low socioeconomic status (ses) communities,” in Teacher Librarian (32)3. pp. 22-25. Sadly, many children in school today have practically no access to books, and no quiet and comfortable place to read. Public libraries cannot close the gap. California ranks near last in the country in number of books and serial volumes per capita in public libraries. Book budgets in California public libraries have been cut 25% since 1989 and the number of hours of operation has declined 30% since 1987. California has among the worst public library access in the United States, and children’s services have been the hardest hit. For many children in disadvantaged communities, public libraries may be difficult to reach, or require a trip through a dangerous neighborhood, which compounds the problem. ​The most effective bridge from low levels of reading ability and higher levels is pleasure reading. This is the kind of reading missing from the lives of many students: 23% of our fourth graders read for pleasure only once a month or less. Research indicates that many children don’t have access to pleasure reading materials. Pleasure reading provides the base for all reading, including academic. Please see Krashen, S.(2004) The Power of Reading, Heinemann Press. Limited library funds results in limited purchasing of pleasure reading materials. Therefore, many children have no access to pleasure reading books. ​Many children have no idea that hardback books exist - having only had access to copies of books. In one case, a group of 12 year old girls take regular 3 hour (round trip) bus rides to the closest mall in order to read copies of their favorite books in the bookstore. Many children in low-income communities do not own a single book!